Columbia University Press, 9780231182904, 448pp. 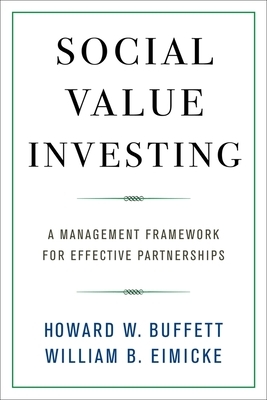 Howard W. Buffett is an adjunct associate professor and research scholar at Columbia University's School of International and Public Affairs. He served as the executive director of the Howard G. Buffett Foundation and coauthored the New York Times best-seller 40 Chances: Finding Hope in a Hungry World (2013). Previously, Buffett oversaw economic stabilization programs in Afghanistan and Iraq for the U.S. Department of Defense. He also served as a policy advisor for the White House Domestic Policy Council, where he coauthored the president's cross-sector partnership strategy. William B. Eimicke is professor of practice and founding director of the Picker Center for Executive Education at Columbia University's School of International and Public Affairs. He previously served as New York City's Deputy Fire Commissioner for Strategic Planning and Policy, as the housing "czar" of New York State, and as a housing policy and management consultant to vice president Al Gore's National Performance Review. He has coauthored four books on topics including effective public management, contracting, sustainability, and management innovation.